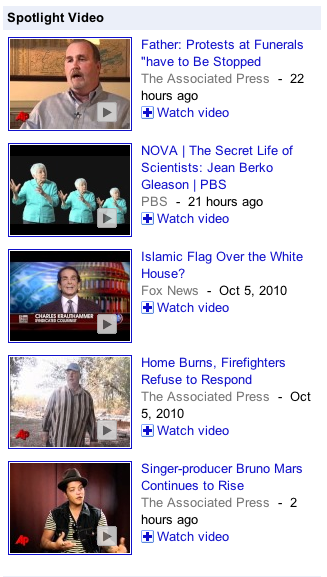 Today in the U.S. we’re launching a new section in Google News called "Spotlight Video" that showcases popular videos from news channels on YouTube like "NOVA: The Secret Life of Scientists: Jean Berko Gleason" from PBS. Google News has always helped users find recent articles from a wide variety of sources. But we recognize there are other types of stories that our users are interested in. So last year, we created the Spotlight section to feature stories of more lasting interest. Like the rest of Google News, Spotlight articles are selected by our computer algorithms, but they aren't your typical breaking news. Instead you'll find stories of enduring appeal such as feature articles, investigative reporting and opinion pieces. In fact, Spotlight quickly became one of our most popular sections. So now we’re shining the spotlight on videos too. In the right-hand column you can find the new Spotlight Video section and check out recently popular news clips, like "Singer-producer Bruno Mars Continues to Rise" from the Associated Press. If your news organization isn't already making its video content available on YouTube and Google News, we encourage you to get started. More information on how to submit your news videos to Google News can also be found in the News Publishers' Help Center. And here are some additional tips on news search engine optimization. Side note: today you may have noticed we also modified the left-hand navigation. Now, as you scroll down the page, the navigation menu will move with you. This way, you can always see the sectional and hot topic quick links. Please tell us what you think and we’ll keep working to improve Google News for you.